In Fall 2005, Professor David Peak and three undergraduates resurrected the Utah State University (USU) SPS and ∑∏∑ chapters, which had been dormant for 15 years. Since that time, under Peak’s guidance and with the continuing efforts of numerous other students, the USU SPS chapter has: (1) hosted 3 Zone 15 meetings; (2) brought to the USU campus National SPS Directors Gary White (2005) and Tony Sauncy (2012); (3) had 10 SPS Scholarship recipients; (4) had 4 SPS Outstanding Undergraduate Researcher recognitions; (5) had 6 Associate Zone Councilors serve on the National Council for 9 years; (6) had 2 SPS summer interns; (7) received 3 Marsh White Awards; (8) received 2 SPS Undergraduate Research Awards; (9) received 1 Future Faces of Physics grant; (10) sent 9 students to three Quadrennial Congresses; (11) been awarded the Blake Lilly Prize for outstanding outreach activity; (12) had eleven photos displayed on the National SPS website including the banner picture for all of 2009 (the International Year of Astronomy); and (13) been subject of the Spring 2011 SPS Observer cover story (for our “20,000 bouncy balls” event), and featured in articles in the Summer 2014 Observer (pg. 4 and pg. 8) and the Fall 2014 Radiations (p. 14). David Peak earned BS and PhD degrees from the New York State University system. After several years post-docking, he joined the faculty of Union College. There, he rose through the academic ranks, eventually becoming the Frank and Marie Louise Bailey Professor of Physics. Among other positions at Union he was Physics Department Head for seven years and Faculty Trustee for two more. 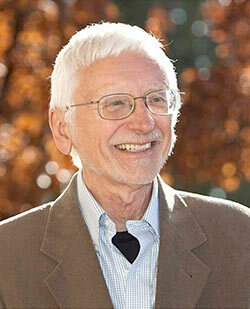 In 1994, he joined his wife Terry on the faculty at USU, he as Professor of Physics and Associate Department Head. Since then the Peaks have established several student-focused endowments at USU, including one that provides continuing funding for its SPS chapter. Long an advocate for undergraduate research, David Peak was a founding member of the Council on Undergraduate Research (CUR) and served for many years as chair of the Board of the National Conferences on Undergraduate Research. He has mentored over 160 of his own undergraduate researchers, more than 20 of whom are co-authors on his publications. Peak’s students have received a Rhodes Scholarship, a Rhodes finalist invitation, a Fulbright Student Scholarship, 21 national Goldwater Scholarship recognitions, and 14 NSF Graduate Research Fellowships. His successful mentoring of undergraduates has been recognized by local awards from three universities, and nationally by the 1996 American Physical Society Prize for Research at an Undergraduate Institution, a 2009 Carnegie Foundation Professor of the Year Award, and the 2018 CUR-Goldwater Scholars Faculty Mentor Award.